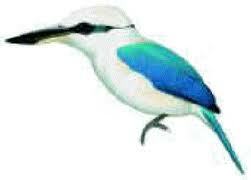 Andrea's sister suggested the bird in your photo might be a Blue Winged Kookaburra, which is a kind of kingfisher. That set me off Googling to check their range and I think you might have been lucky enough to see one of the few remaining Marquesan Kingfishers. These are crtiticallly endangered - estimated to be 693 birds remaining in 2004. Apparently Great Horned Owls killed them all off on Hiva Oa and they only survive on Tahuata now. Picture and some links attached. There are roughly 90 species of Kingfisher, but many are threatened with extinction. You will find at least eleven species ‘near threatened’, six ‘vulnerable’, one ‘endangered’, and two ‘critically endangered’ on the IUCN Red List of Threatened Species http://www.iucnredlist.org/apps/redlist/details/106001131/0. The Marquesan Kingfisher and the Tuamotu Kingfisher are both considered ‘critically endangered’ and are at grave risk of extinction. Researchers estimated only 693 Marquesans remained in the wild in 2004. Introduced species, especially feral livestock (including cattle, horse, goats, sheep, and pigs), have caused extensive damage to this species’ forest habitat. Additionally, introduced predators, especially the Great Horned Owl, black rat, and common myna, have significantly contributed to this kingfisher’s decline. In fact, Great Horned Owls caused this bird to become extinct on the French Polynesian island of Hiva Oa. Today, this species can only be found on the island of Tuhuata. Experts are gravely concerned that the Great Horned Owl could be introduced to this island and wipe out the few remaining Marquesan Kingfishers. The Tuamotu Kingfisher, also ‘critically endangered’, is even closer to being lost forever. Studies between 2006 and 2008 estimated only 125 individuals were left on the French Polynesian island of Niau. Their quality of their forest habitat there has been greatly reduced by cyclones, which have caused a significant loss of suitable nesting trees for this species. Any potential land management changes could be catastrophic for this imperiled bird.